Location: Nr Oldcastle, Co Meath, Ireland (N 585 775). Grid Reference: 53° 44' 37.77" N, 7° 6' 47.66" W.
The cairns at Loughcrew form the largest complex of passage graves in Ireland. The engravings are on-par with those at the Boyne Valley, and the orientations of the mounds shows a clearly associated with significant moments of the solar year. Loughcrew stands out from its surroundings through the three peaks, known as Cairnbane West, Cairnbane East and Patrickstown. Scattered over these peaks and the slopes of Loughcrew are 30 megalithic cairns in various states of decay. Loughcrew; from 'Loch Craobh', (The Lake of Branches), is a collection of passage mounds spread across four adjoining hill-tops. Unfortunately, it seems as though much of the site was lost, as there were probably once as many as 50 passage mounds on the site (1). The site is well worth visiting as if not just for the views. Although the main mound is closed, there are still plenty of open mounds to explore, with engravings of spirals etc on nearly every one. Cairbane West: Fifteen remaining monuments. When Conwell arrived in 1863 the roof had collapsed and the chamber was full of rubble. He estimated that the capstone probably stood between 16' and 18' above the floor of the chamber. He made a large number of finds in Cairn L, including two large stone spheres and several smaller chalk balls under the large basin in the left recess. These can be seen in the National Museum of Ireland. Patrickstown: Five remaining but destroyed monuments: Cairns Y, YB, X, XA, XB. Rayed-circle or 'calendar-stone' from Cairn-X. 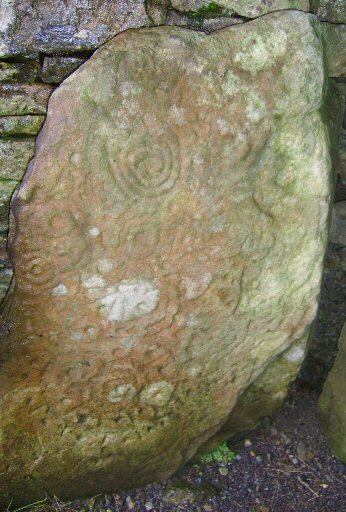 (similar to that seen at Knowth: K15). Cairnbane East: The eastern hill where as many as 21 sites are said to have been destroyed. The remains of only three can be seen today, including one of the largest, and most prominent monuments of the whole site, Cairn-T.
Cairn T, One of the largest tombs in the complex is positioned so as to be at the highest point of the whole complex. similar in design to Newgrange). Orientated to the Spring Equinox, it possesses a total of 19 decorated orthostats, 2 decorated sill-stones, 8 decorated roof-stones and 1 decorated kerbstone (Shee Twohig 1981, 214). It is locked but accessible by obtaining a key from the tea-house at Loughcrew gardens. The monument is complete except for its capstone, which has been replaced with a grill. The mound was also covered with a mantle of quartz, which was mentioned by early visitors but no longer exists today. 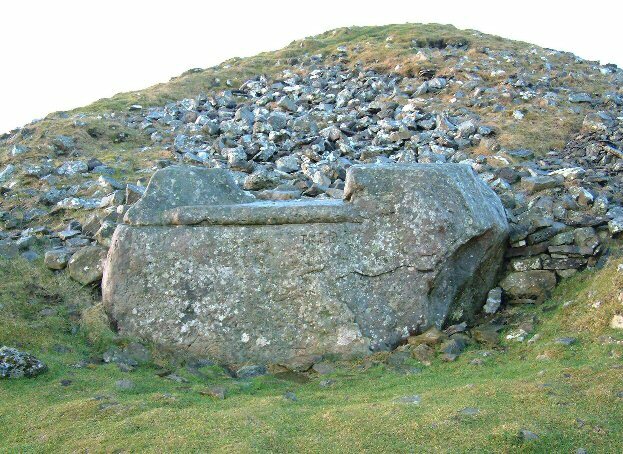 The huge stone called the 'Hags/witches' chair is on the northern side of the mound and therefore faces the direction of the pole star. 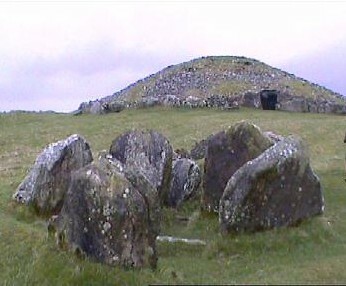 The inside chambers of the mound are separated by 'sill-stones' in the ground, a design feature also seen at several of the mounds at Carrowkeel. 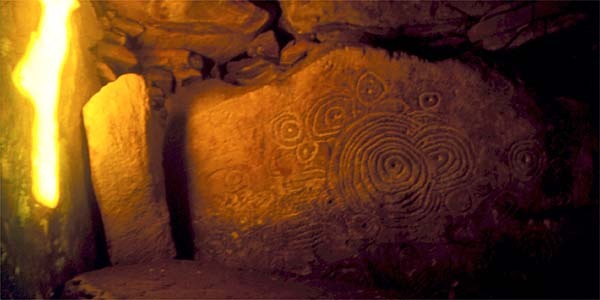 It is a cruciform chamber, with a corbelled roof and some of the most beautiful examples of Neolithic art in Ireland. 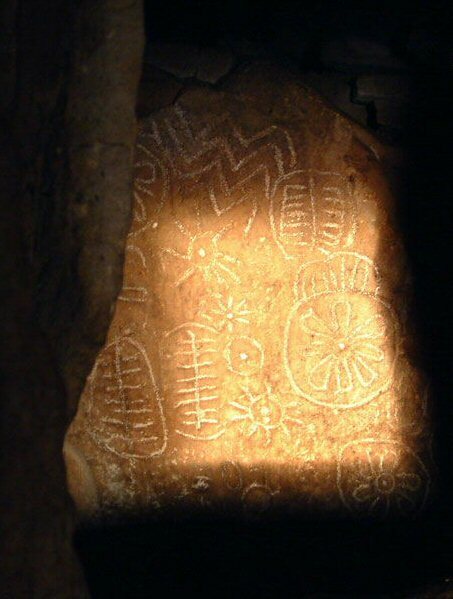 During the Vernal and Autumn Equinox at dawn the sunlight enters the chamber and illuminate the inside of the tomb. 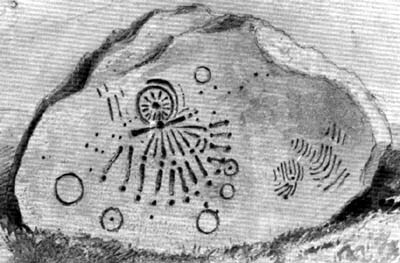 Chronology - There is as yet, no radio-carbon dating of Loughcrew, but it has been observed that the rock engraving techniques appear to be more primitive than at the Boyne Valley complex, suggesting an earlier date. Both Cairn's L and T demonstrate clear solar orientations. Local Tradition: The name associates the hills with the 'witch or hag', both female and said by some to be a memory of the earth-mother goddess. Solar wheels, circles and cup-marks on stone L1, (Left), and the 'Equinox-stone' C8, at the rear of the west recess (Right). 1) M. Brennan, The Stones of Time, 1994, Inner Traditions.